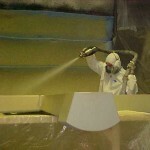 Benchmark has been molding expanded polystyrene (EPS) blocks and custom molded parts for more than 25 years. We control the entire manufacturing process from beginning to end, expanding and molding the EPS used in our signs. The EPS core material gives the sign its shape and structure. Starting with the best material possible ensures the best, finished products. We closely monitor the quality of EPS that goes into our signs, without relying on outside suppliers. Our EPS conforms to ASTM C578 specifications. Our craftsmen are trained technicians with many years of experience in manufacturing custom interior and exterior signage. Sign Products Made In The USA!